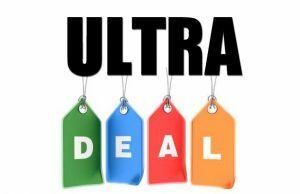 Summary: This laptop offers performance, battery life and a full-size 15-inch screen in a compact and extremely light chassis made out of magnesium alloy, all packaged into a competitively priced bundle. 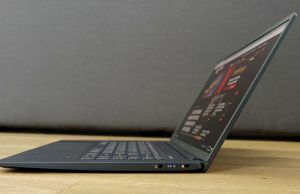 It's not without its share of quirks, with the speakers and overall typing experience being my least favorites, but it's at the same time an improvement over the previous 14-inch Swift 5s and one of the most compelling offers in its niche of thin-and-light laptops with a full-size display. We documented our experience in the article below, yet some questions remain to be answered in a future update. 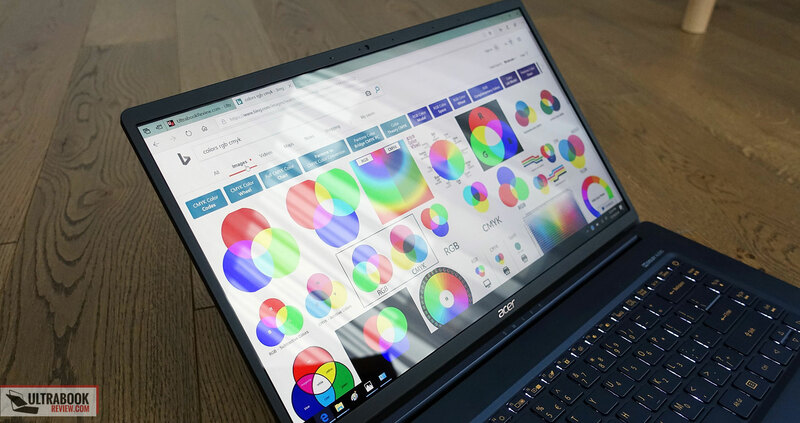 In this article we’re going to talk about the lightest 15-inch laptop available as of the Fall of 2018, the Acer Swift 5 SF515-51. 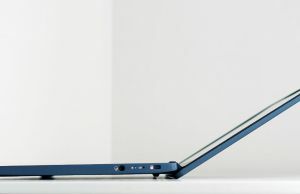 I’m highly skeptical around any device associated with the words “lightest” or “thinnest”, but this one is actually a pretty solid product with some unique traits. 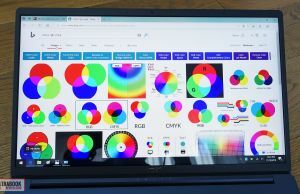 There are plenty of light or full-size laptops out there, but there are very few that check both boxes, and even those are not widely available (the LG Gram 15 or the Samsung Notebook 9). 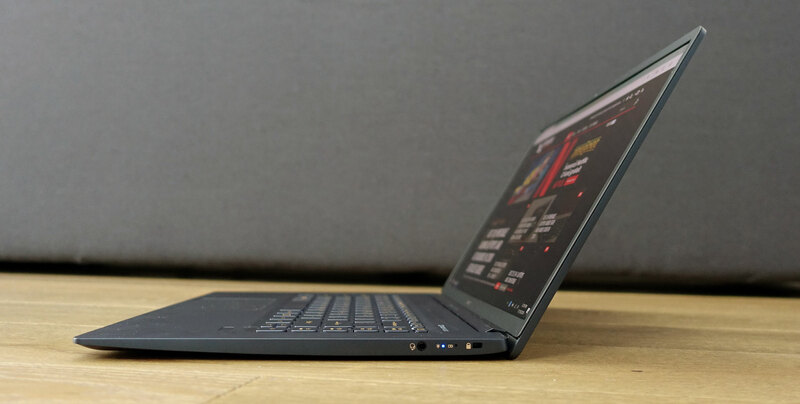 You’ll find the Swift 5 15-inch in stores all over the world though, from Q4 2018, and while it’s compact and light (just under 1 kilo, or 2.2 lbs), it doesn’t sacrifice on the hardware specs, features and especially battery-size, unlike the 14-inch Swift 5 we’ve reviewed in the past. It’s also competitively priced for what it is, starting at around $1100 at launch. 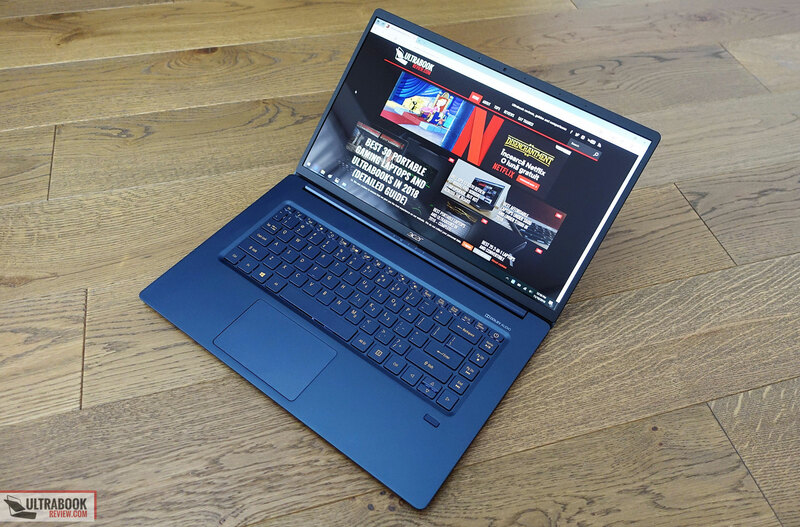 This is the kind of laptop you’ll want as a daily-driver, for email, browsing, video content, music and so on. 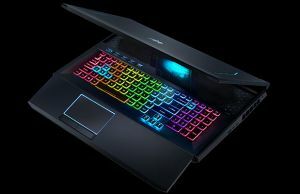 Performance in demanding loads or games are not among its strong-points, as it’s built on Intel Core U hardware, just like the smaller 13 and 14-inch ultraportables out there, so it’s pretty much a thin-and-light laptop with a full-size screen. 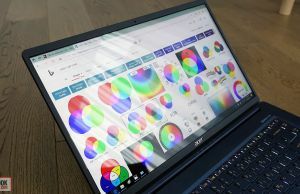 We’ve spent the last few weeks with the 15-inch Acer Swift 5 and gathered our impressions in this article, with the positive aspects and the quirks. Our test model is however a pre-production sample, which means we ran into some issues that should not affect the final retail units when those are available in stores. 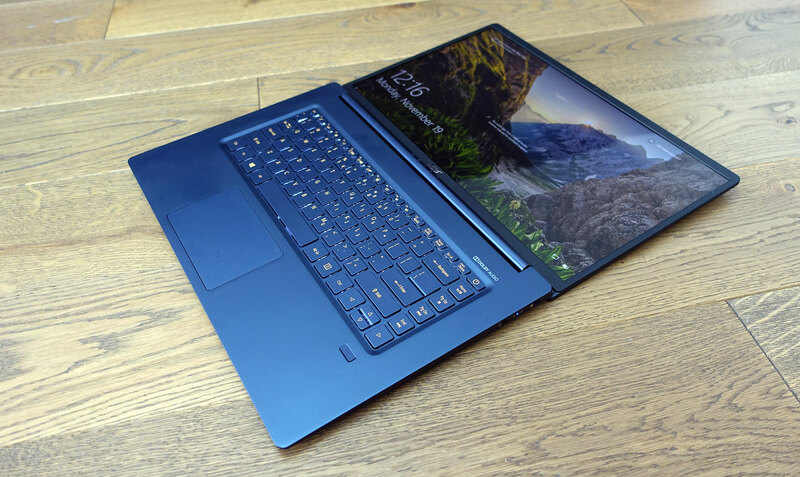 We’ll talk about these when we get to them, so read on if you’re interested in this laptop. 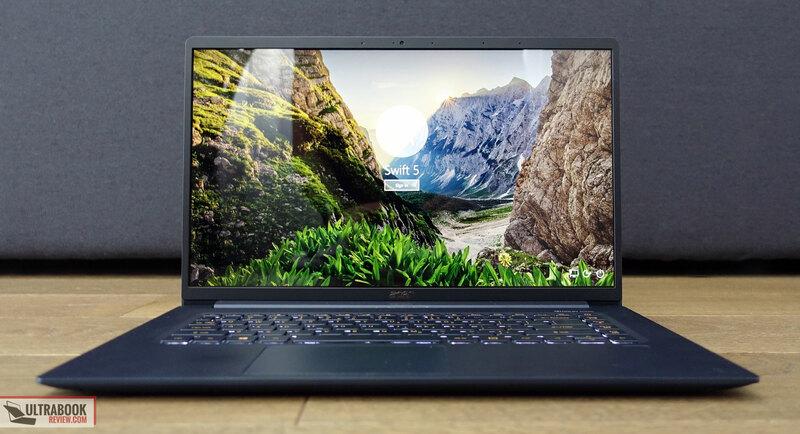 Let’s start with the elephant in the room: this is the lightest 15-inch laptop on the market, at under 2.2 lbs in the configuration we got for tests. 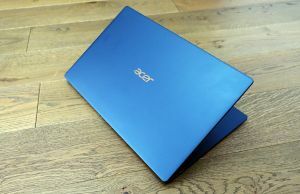 That’s mostly made possible by the fact that the chassis is built from a magnesium-lithium alloy, a very light and at the same time sturdy material, which Acer also used on the previous Swift 5 14-inch models launched in the last year. 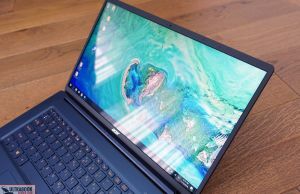 Other manufacturers have been using magnesium alloys for their laptops as well, like Microsoft on some of the Surface Pro lines. Based on the feedback from existing Surface Pro owners, the material ages well for the most part, but it scratches easily, so it’s best to keep your computer in a sleeve when traveling. That aside though, magnesium alloy constructions are significantly lighter than aluminum shells, without a sacrifice in rigidity. 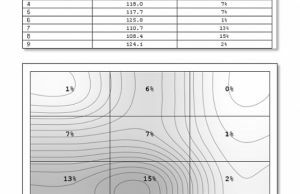 This Reddit thread does a pretty good job at explaining how magnesium and aluminum builds fare against each other. All in all, the Swift 5 is light, but still feels nice to the touch and sturdy in hand. The lid and keyboard deck flex a fair bit when pressed, something you’ll just have to accept and get used to, but otherwise the overall chassis construction is spotless, without any squeaks or funny noises even when you grab this from a corner (not advisable, though). Even the plastic used for the bezel around the screen is the high quality kind, with a smooth rubbery finish. Speaking of bezels, this laptop is not only light, but compact, as you can tell by the bezels around the screen and small chin beneath, as well as fairly thin, yet with enough space to allow room for some full-size ports on the sides. 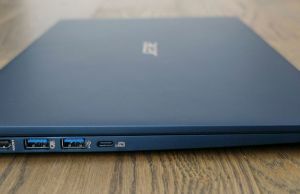 The IO is nonetheless a little lacking, with USB-A and C ports, as well as full-size HDMI for video output and a headphone jack, but without a card-reader or Thunderbolt 3. All the connectivity is lined on the left edge, including the PSU, which makes this ideal for right-handed users, but might bother the lefties among you that plan to hook up a mouse. 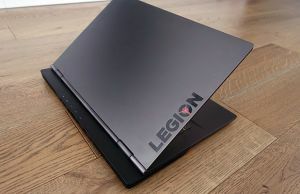 Acer did a great job with the overall aesthetics, brushing up some of the leftovers of the 14-inch versions. 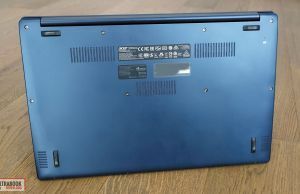 The entire shell gets a dark blue theme, including the hinge’s cover and the sides, with some slight gold accents for the Acer logos and the writing on the keyboard. Branding elements have been kept to a minimum, with just two Acer logos and a Swift engraving on the hinge, and there are no annoying lights, accents or even stickers on the inside, at least on our sample. The status LEDs were moved on the side, out of the way. Certain aspects can be however improved when it comes to this computer’s practicality. For one, there’s no crease on the front lip, so catching on the screen in order to lift it up can prove a little challenging. 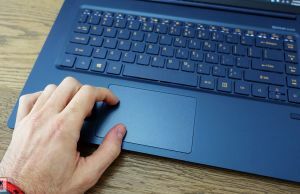 Then, you’ll actually need both hands to open and adjust the screen, which on the other hand is hold in place by a sturdy hinge that allows it to lean back flat to 180 degrees, something I greatly appreciate on any laptop. 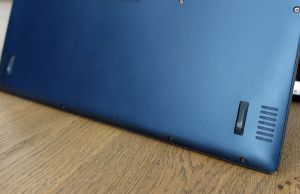 These aside, the rubber feet on the bottom are fairly small and rigid, but they keep the laptop anchored on a flat surface. 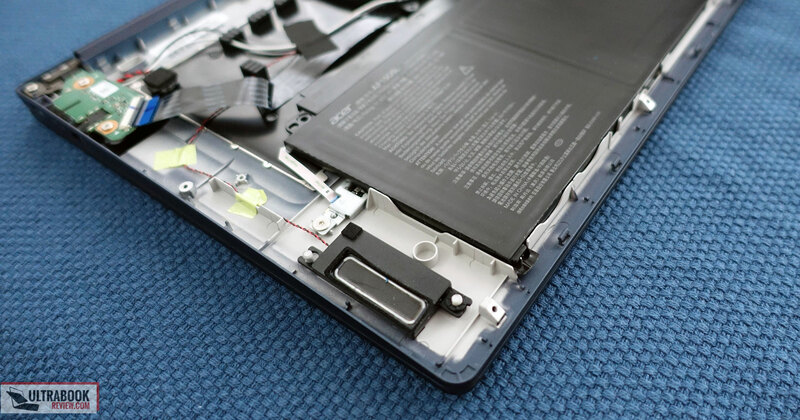 However, you’ll notice that this device lifts on the bottom of its screen when the display leans back past 130 degrees, an approach meant to provide a slightly inclined typing position and improve airflow underneath. 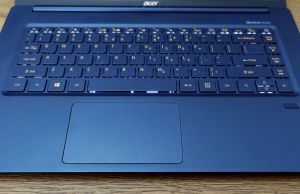 However, Acer did not place any rubber feet at the bottom of the screen, unlike the other manufacturers who use this same approach, and as a result the laptop sits straight on the magnesium shell, which on one hand makes it less stable of a desk, and on the other will cause the contact points to scratch and wear off over time. 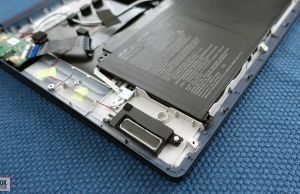 I’ll also have to mention the fairly sharp front-lip of the inner deck, which corroborated with the rather short palm-rest that results from the fact that the keyboard is placed low onto the body, can become unpleasant on your wrists when typing in cramped places, without ample arm support. It’s not however going to bother you in any way as long as you put the computer on a spacious desk that would keep the wrists on top of the edge, out of harm’s way. All in all, this laptop looks nice, in a simple, subdued way, and feels much sturdier than I would have expected from a “lightest” kind of computer. I can’t however look past the various practicality quirks that can take a toll on the overall experience, like the stiff hinge that requires both hands to operate, the sharp front lip and the fact that there are no rubber feet at the bottom of the screen and the entire chassis lifts straight onto the magnesium shell. 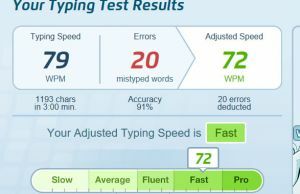 You’ll need time to get used to the keyboard Acer puts on this laptop, and even then you might struggle with it. The layout is mostly fine, with well sized and spaced keys that have a nice soft coating and feel great to the touch. There is however an extra line of Function keys to the right, and you might end up hitting those when looking for Enter or Backspace, at least on the first encounters. There’s also the Power button placed in the top-right corner, and I’d advice you to disable it from Windows if you don’t want to accidentally put the laptop to sleep when looking for Delete. My knits are with the feedback, though. As with most ultraportables available these days, this 15-inch Swift gets a short-travel keyboard, and I’m usually into this kind of implementations that allow fast typing speeds and quiet operation. 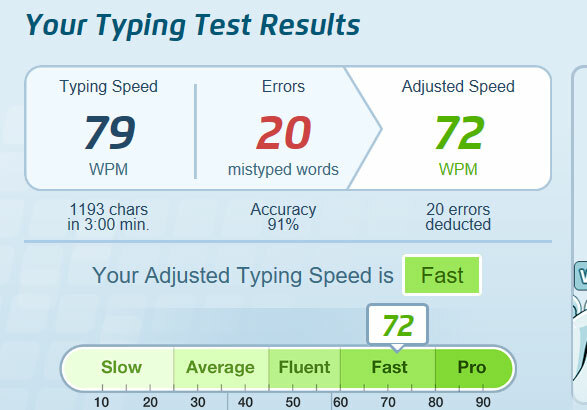 These keys however put little resistance and depress way too easily, which for me lead to sub-par typing accuracy, even after typing several thousands words on it. On top of that, this is also fairly chattery and might distract those around you in a library or other very quiet places. This keyboard is backlit, of course, but there are no illumination levels to choose from, it’s either On or Off. As side notes, you can’t activate the illumination by swiping your fingers over the clickpad, you actually have to press a key to do it, and some of the light creeps out from under the keys in an annoying way, especially from beneath the Space key, as you can see in the attached pictures. Oh, and some of you might also be bothered by the fact that there are no indicator LEDs to let you know when CapsLock or NumLock are active. 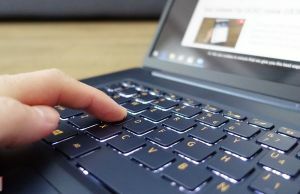 The clickpad sits just beneath the keyboard, and it’s rather oddly placed towards the left side of the laptop, not centered under the Space key like with other laptops. It’s also a tad small, especially for a 15-inch laptop, as the keyboard is placed low onto the frame and leaves limited space underneath. As far as specs go, this is a Synaptics surface with Precision drivers, and it’s made out of a smooth, nice feeling plastic. I can’t tell you much about its behavior though, as our test unit got a defective implementation that rattled when tapped and couldn’t properly register physical clicks, but handled swipes, gestures and taps just fine. 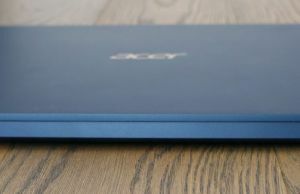 Final retail versions will get proper touchpads though, and since Acer puts the same touchpad on the 14-inch version of the Swift 5, you can find our impressions of a properly working implementation in that review. 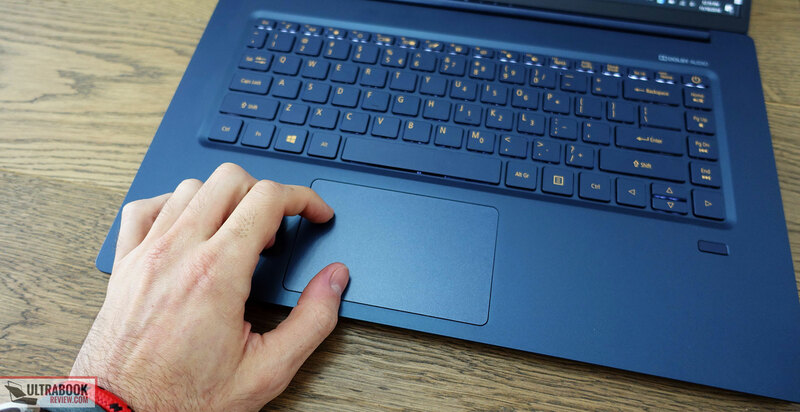 There’s also a finger-sensor on this laptop, placed towards the right-side, next to the arrow keys. It’s properly sized and works well for logging into Windows. 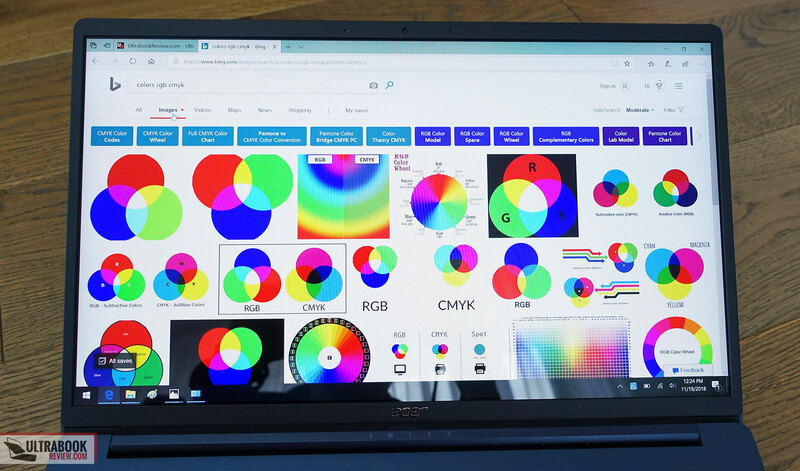 This notebook gets a 15.6-inch screen with narrow bezels and a fairly good IPS panel. Acer still stuck with the decision to use a glossy finishing here, just like on the 14-inch model we’ve seen in the past, despite the fact that there’s no touch, which on one hand has a slight positive impact on the image quality (livelier colors, no graininess), but also negatively affects visibility in bright environments. It’s up to you if the trade-off is acceptable or not. 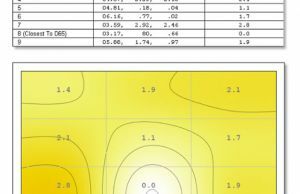 The panel is fairly well calibrated out of the box, but you can use this color profile to address the slight gamma and gray-level imbalances. 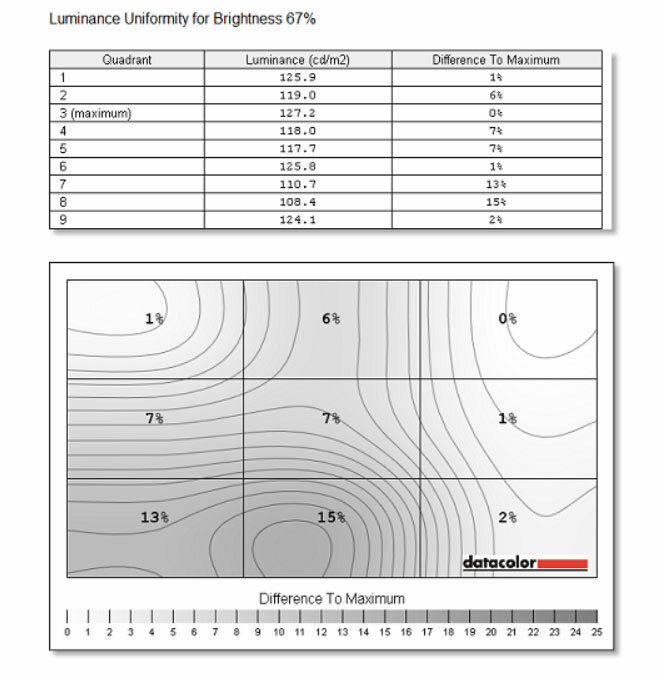 Our tests also measured some brightness uniformity issues, with the lower end the the screen being dimmer than the middle and top at mid-range brightness levels. I didn’t notice any light bleeding or panel pinching though, yet that’s not a guarantee you won’t get any with your unit, with the kind of QC we’re seeing these days from all OEMs. 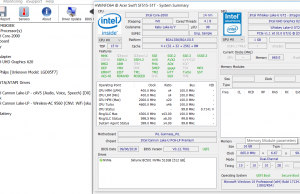 Our test unit is a highly specked version of the Acer Swift 15 SF315-51, with the Whiskey Lake Core i7-8565U processor, 16 GB of memory and a 512 GB PCIe SSD. However, this pre-production sample did not perform as expected, so for the time being we cannot comment on performance in demanding loads based on this test unit. 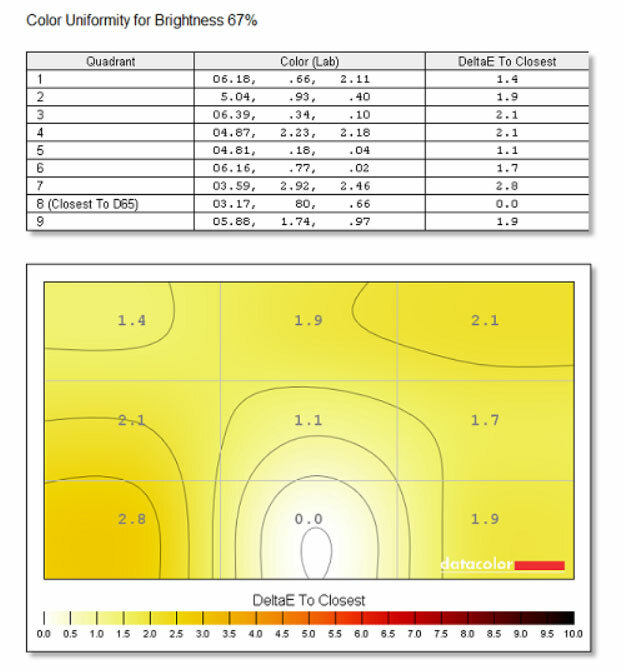 We’ve asked for a newer sample and will hopefully update this section in the future. 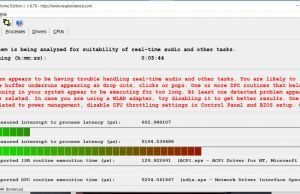 In the meantime, you can find what to expect of Whiskey Lake implementations from our other reviews. 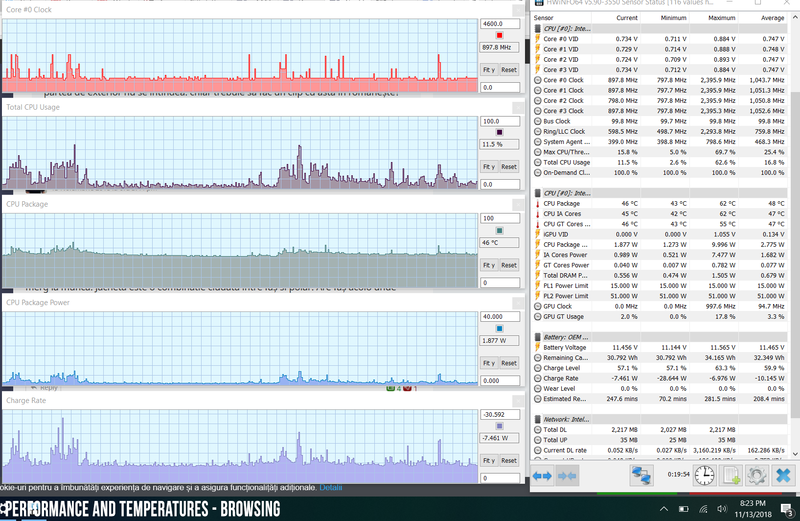 We can also show you how our sample handled daily use scenarios like video streaming, typing or browsing. You’ll find details in the HWInfo logs below. 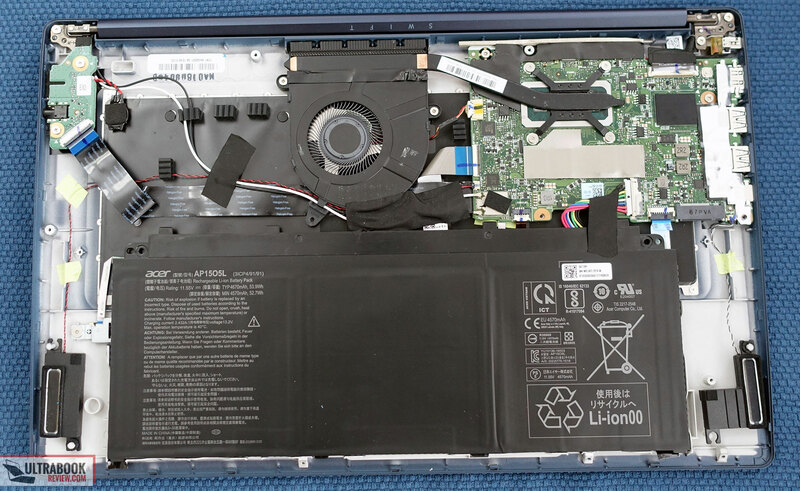 We’ll also mention that while it’s fairly easy to get inside this laptop by removing the back-panel hold in place by a handful of clearly visible Torx screws, you probably won’t have to do it. The CPU, the RAM and the included SSD are all soldered on the motherboard, but there’s also an extra M.2 80 mm slot in case you want to expand the storage. 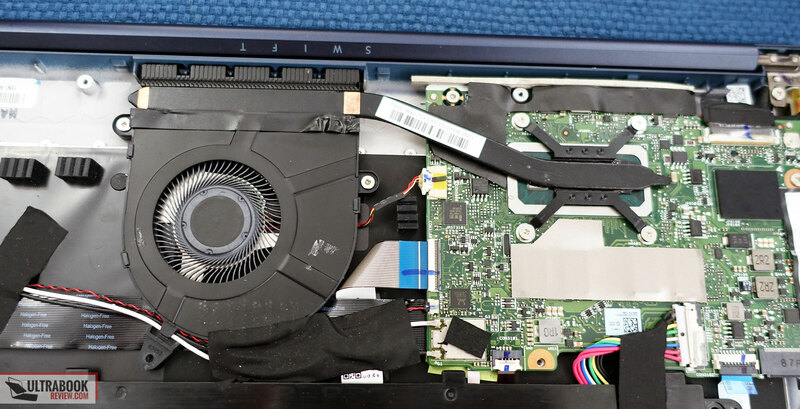 Acer went with a very basic cooling implementation, with a single fan and short heatpipe that links a radiator to a surprisingly small CPU plate, smaller than the plate used on the 14-inch Swift 5. In theory this implementation should be able to keep the Whiskey Lake processors at bay, but we can’t confirm it based on this sample and it might end up interfering with performance in demanding loads. 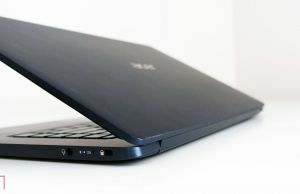 The cooling is further helped by the ample intakes on the underbelly, as well as by the fact that the laptop lifts up and increases the gap between the main-body and the desk, for improved airflow. Hot air is blown out through a grill behind the hinge, partially towards the back and partially towards the screen, a fairly standard solution that won’t pose any long-term reliability issues. 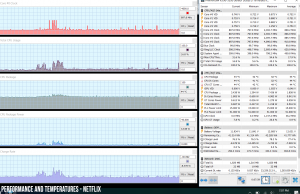 Unlike on the 14-inch Swift 5 tested in the past, the fan inside our 15-inch sample was always active, both with basic tasks and with everyday multitasking. 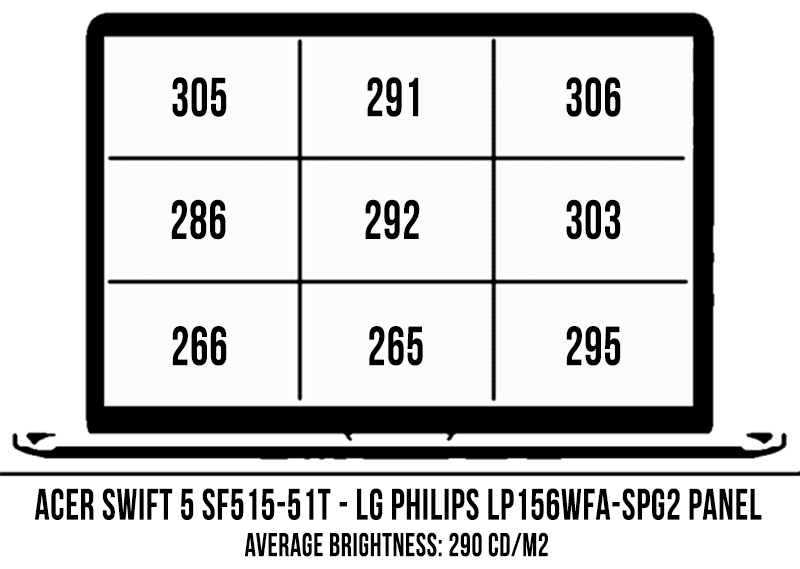 I reckon that’s a quirk associated with this pre-release sample and final units will get a more tamed down fan profile that’s going to keep it inactive with daily use, like on the smaller Swift 5. 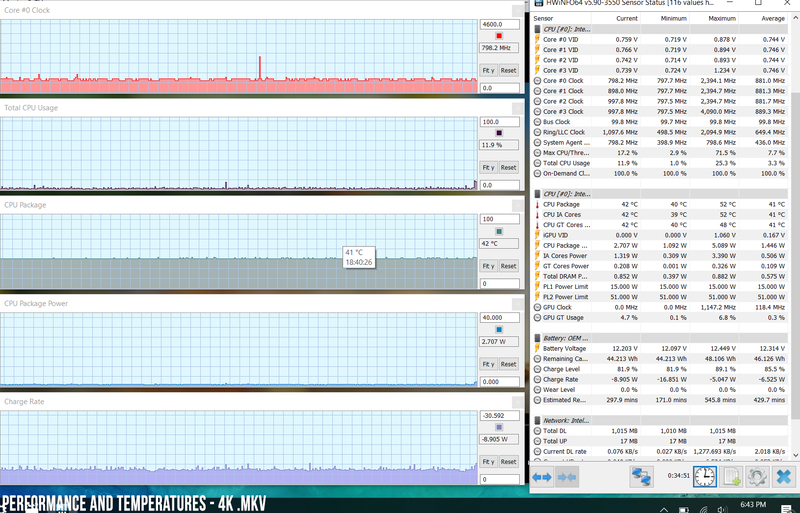 Even so, this is a quiet fan, averaging about 38 dB at head-level with everyday multitasking and ramping up to about 40 dB with games, at a room ambient level of about 34 dB based on our Sound Meter. 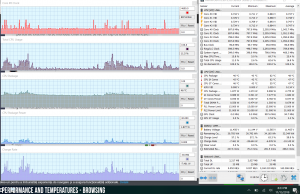 As far as outer shell temperatures go, this laptop keeps very cool with basic tasks, and barely gets warm with multitasking, which once more suggests it could be passively cooled for most of the time, with a less aggressive fan profile. 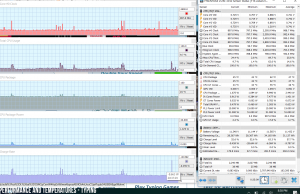 Normally we test temperatures under load while running NFS: Most Wanted, but we couldn’t properly run that in this case due to the issues mention in the previous section. 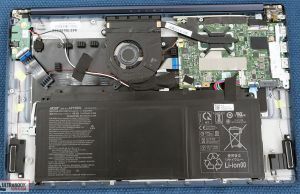 For connectivity there’s a latest gen Intel Wireless AC 9560 wi-fi module inside this laptop, with Bluetooth 5. It didn’t perform as well as other implementations of this same chip with our setup, only reaching transfer speeds of around 300 Mbps near the router and 200 Mbps at 30 feet with obstacles in between, yet that’s probably another drivers issue with this particular early sample, judging by the performance of the similarly designed 14-inch Swift 5 tested in the past. Acer went with different speakers on this laptop though, and they’re actually rather poor, with tinny sound coming out of the cuts on the underbelly and mid-range volume, of up to 76 dB at head-level. I haven’t noticed any distortions at higher volumes, so there’s at least that, but you should be careful not to cover the speakers when using the laptop on the lap. If you’ll peak inside you’ll notice that the speakers are actually really small, and there was plenty of room to fit larger ones, yet they were probably sacrificed on the altar of ” the lightest”. 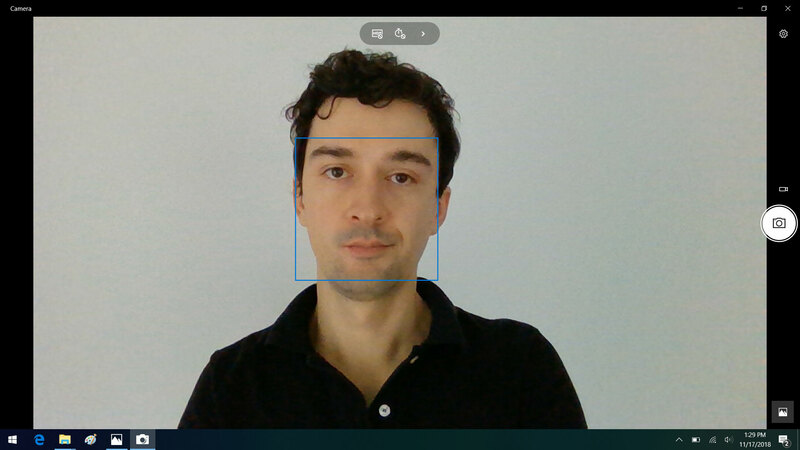 There’s also a webcam placed at the top of the screen, capable of taking decent shots in a well lit room. It’s nothing to brag about, of course, but should do fine for occasional calls. 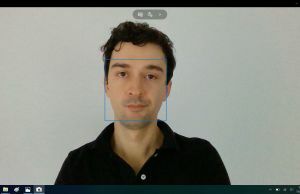 An array of mics flank the webcam, and Acer also placed a set of far-field microphones on that upper bezel, useful if you’re into “talking” with Cortana. 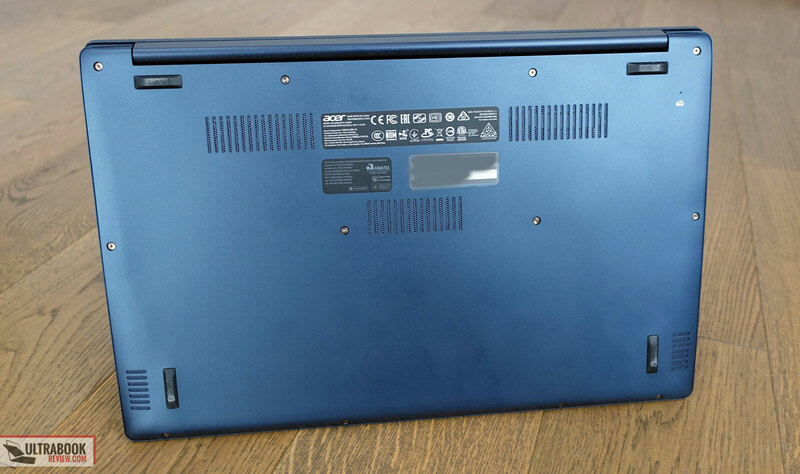 This 15-inch Acer Swift 3 SF515-51 gets a 54 Wh battery inside, so luckily this is not another important aspect Acer sacrificed in order to reach the status of “the lightest 15-inch laptop”. Here’s what we got on our sample in terms of battery life in various scenarios, with the screen set at 30%, roughly 120 nits of brightness. 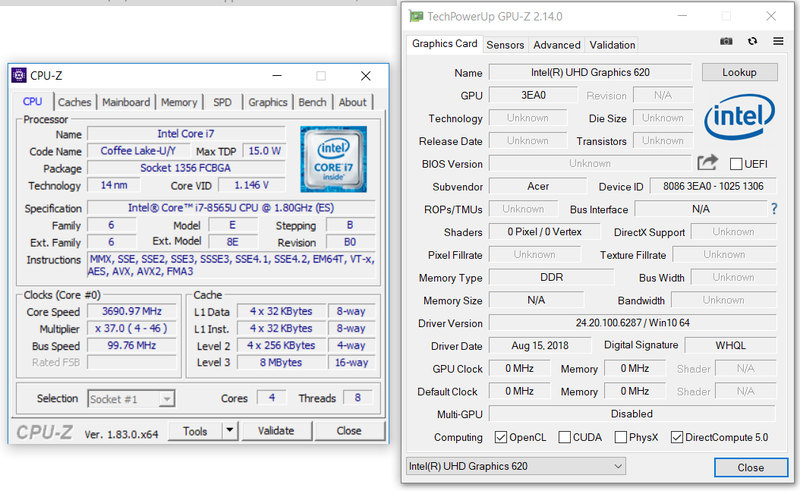 Keep in mind we’re dealing with a pre-production sample here, and based on our experience with other Core i7 U laptops I’d expect these to improve by about 20% with better optimized drivers and an undervolted CPU profile, so take that into consideration. 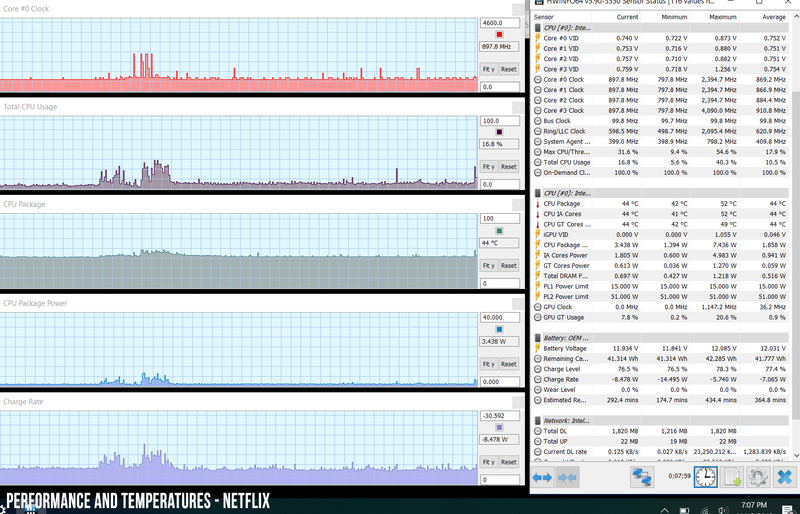 10.2 W (~5 h of use) – browsing in Edge, Better Performance Mode, screen at 30%, Wi-Fi ON. Our test unit came with a standard 45 Wh power brick and a full charge takes around two and a half hours. This also charges via USB-C, but slower, at only about 15W per hour with the 45W power adapter from the Acer Chromebook Spin, so a full-charge took about 4 hours in this case. 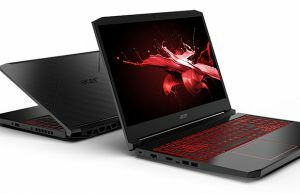 The 15-inch Acer Swift 5 SF515-51T is scheduled to start at $1099 in the US and 1099 EUR over here in Europe, for the basic configurations with the Whiskey Lake Core i5-8265U processor, 8 GB of RAM and a 256 GB SSD, while the higher-specked version with the i7 processor, 16 GB of RAM and a 512 GB SSD should be available for around 1400 USD/EUR. At the time of this article this is already available in Europe, while customers in North America should get it around January 2019. We’ll update this section once we know more, and in the meantime you can follow this link for more details, updated configurations and prices. 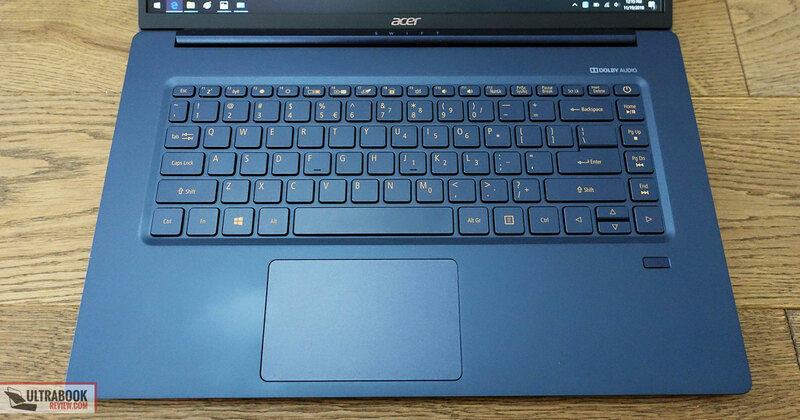 As a side note, Acer also offers a smaller 14-inch variant of this laptop, the Swift 5 SF514-53T. It’s about the same weight and about the same in terms of hardware specs, but a tad more compact and cheaper by 100 USD/EUR. 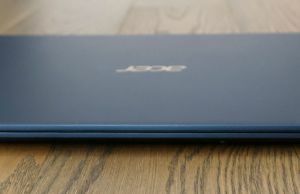 We haven’t yet reviewed this series, so make sure to look for some reviews, just to see how and if Acer addressed the issues of the previous Swift 5 514-52T line. 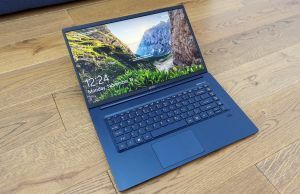 If you’re after a light and compact computer for everyday use, browsing, text-editing, movies and regular multitasking, the Acer Swift 5 SF515-51T could offer all these in conjunction with a full-size screen and a fair price. 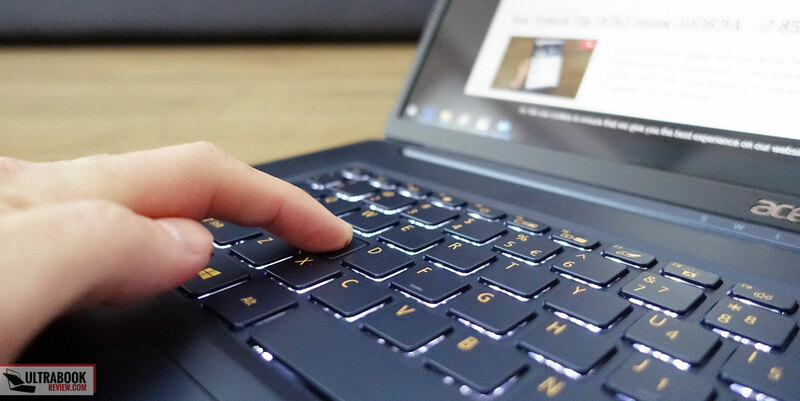 It weighs just one kilo, so it’s one of the most comfortable to carry around laptops out there, and it doesn’t’ sacrifice on the looks, the build quality, the screen or battery life. 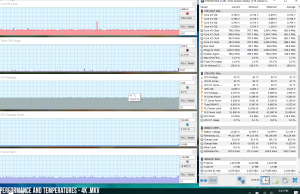 We didn’t get to properly test the performance in more demanding loads, but I performed well with the casual chores, and if demanding loads are not even on the list, I would definitely suggest going with one of the more affordable Core i5 configurations. 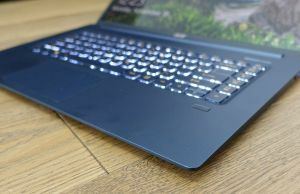 You’ll still pay a premium over the other 15-inch laptops of the moment, mostly for the lightweight build, and have to accept its particular design quirks, the fairly lousy speakers, a glossy screen and a rather weird, shallow keyboard. It’s up to you if these are worth the traded off for the design and lightweight build. 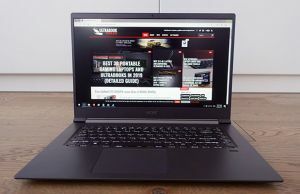 That’s about it for this early review of the Acer Swift 5 SF515-15, the lightest 15-inch laptop on the market as of November 2018. Look further for our future updates, and in the meantime get in touch if you have any feedback or comments. 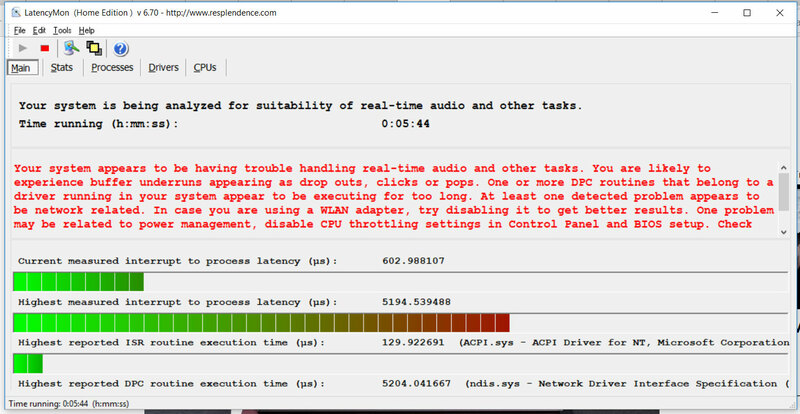 XTU is not compatible with any of the 8565U laptops I've tried. 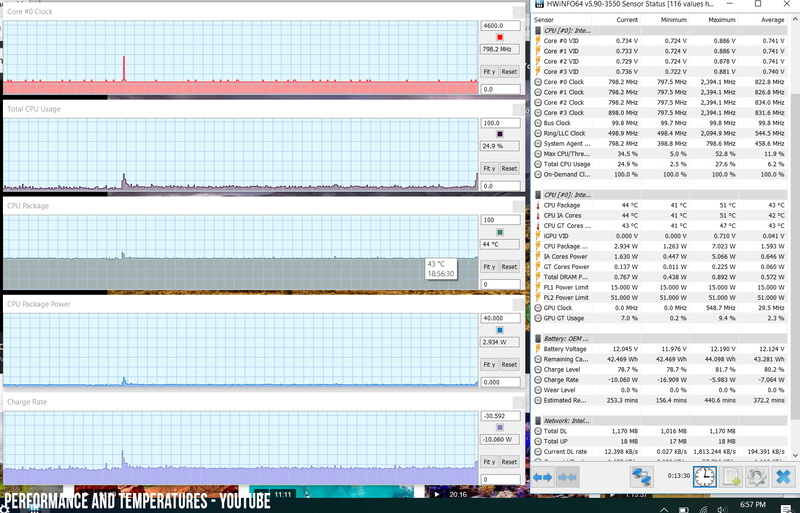 Still, HwInfo shows 4.1 GHz on all cores, 4.5 Ghz on 2xC and 4.6 GHz on 1xC. 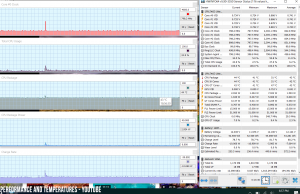 You'll hardly get this in consistent loads though on an ultraportable, the cooling is not able to keep the CPU at that kind of TDP for long. 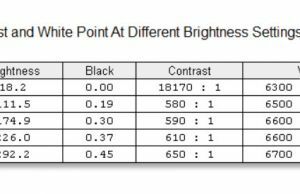 Any news about final sample for test? 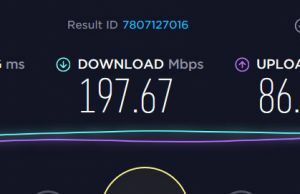 Looking to buy this, but waiting for confirmation about throttling on loads.. Only option on this segment as LG & Samsung aren't available here.. 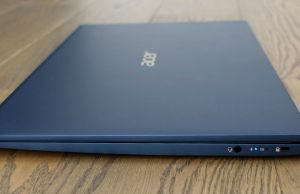 This model or zenbook 15 ux533, similarly specked? We haven't yet reviewed the UX533, so can't comment on it. 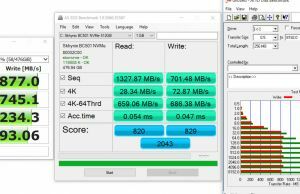 it‘s not easy to compare, but i‘m between this swift 5 515 and the zenbook ux433 (the Swift 5 14 has got a bad screen and battery). In germany both are the same price range about 1100€. You can also get a another version of the zenbook ux433 with a matte screen (+100€). 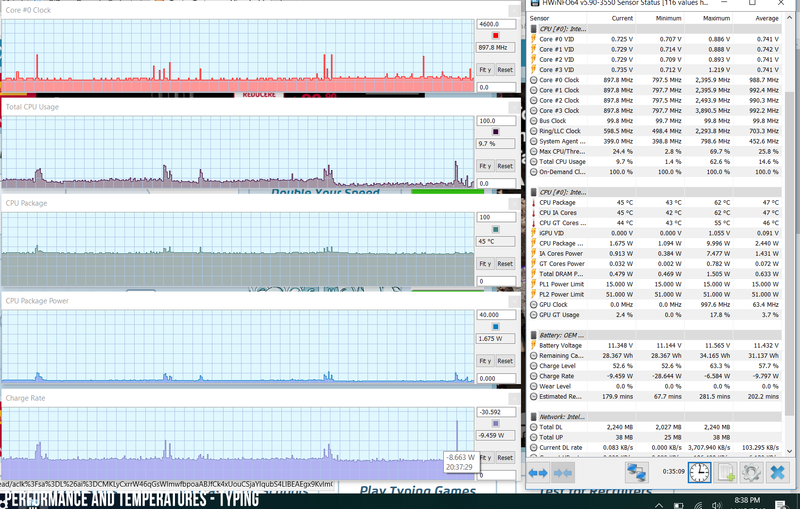 For now i’m between Swift 515, ux433glare, ux433 non-glare. It would depend on what you want. 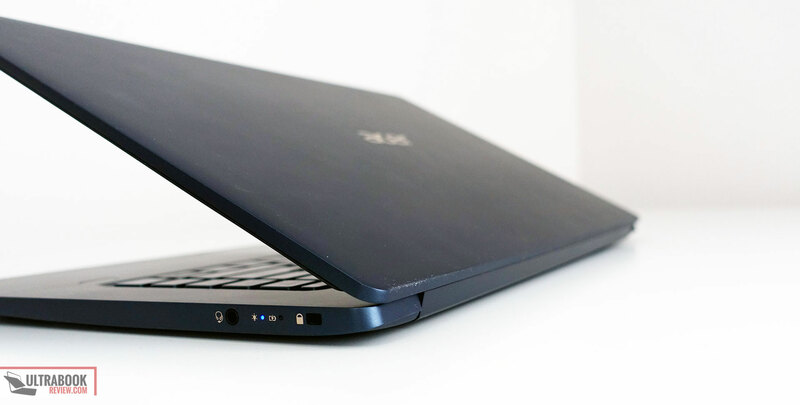 The UX433 is smaller and gets a nicer keyboard, the Swift is lighter, gets a slightly bigger battery and more ports. 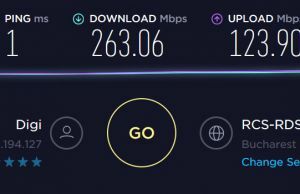 I would however look into more reviews of the Swift , we had some performance issues with our sample and you should find out if the final retail units perform better or not. If not and if you plan to run more demanding tasks, I'd stay away. it's hard to find another good review. Also theres no local dealer which has an example. Just a few shops on the internet has got this swift. 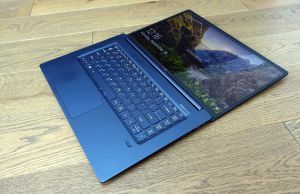 so i am going to focus myself on the zenbook! 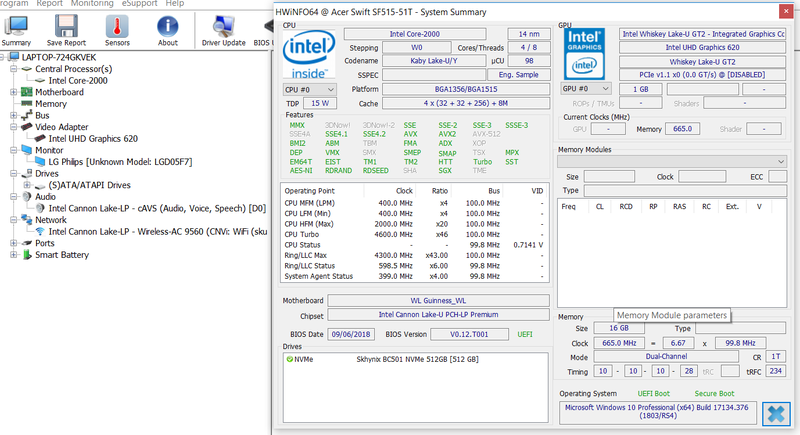 Incorrectly Specs: model and screen at least. But it's sf515-51t and screen is touch and glossy. Thank you for the review! 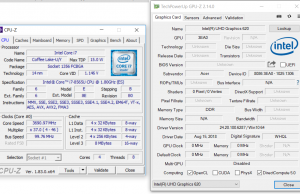 Looks like a new BIOS version and other drivers are available to download. Not sure if you will ever get a chance to retest the battery life and overall performance!